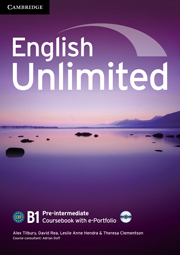 This pack consists of a Coursebook with e-Portfolio and Workbook with DVD-ROM. The Coursebook uses universal topics and activities, and a focus on intercultural competence to encourage effective communication. The e-Portfolio CD-ROM allows learners to create a 'can-do' record of their work and progress. It also provides reference tools and a vocabulary trainer. The Workbook enables learners to consolidate the work done in class. It provides extra 'Explore Writing' tasks, a complete 'Explore Reading' syllabus and 'Over to you' exercises allowing personalisation of language practice. The DVD-ROM includes video for each unit with customisable 'QuickCheck' tests to monitor progress.